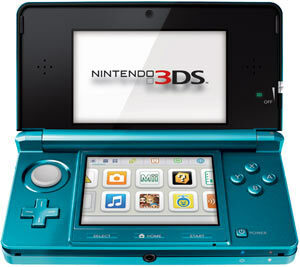 Nintendo 3DS is a groundbreaking hardware release that brings 3D gaming to the handheld market for the first time. 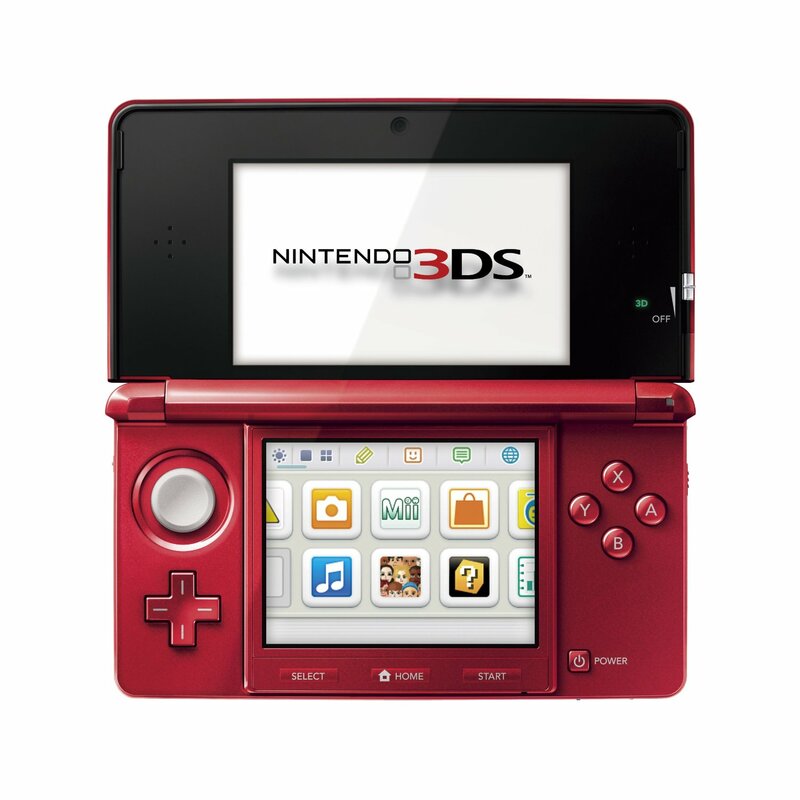 The fourth major release in the DS product line, the Nintendo 3DS utilises 3D Slider functionality and an improved top LCD display to present a glasses-free 3D effect on compatible games, while giving players the option to moderate the effect as they see fit. Taken together with additional features including full analogue control in 3D game environments, motion and gyro sensors that transfer the movements of the handheld into the game, 3D camera functionality, an adjustable stylus and full backwards compatibility and you have not only a must-have system, but a revolution in handheld gaming. Nintendo brings amazing 3D, no glasses graphics to handheld gaming. The telescoping stylus can be adjusted to the length you want. New controls including the 3D Depth Slider and the Circle Pad analogue control. Exciting new functionality and software available on day one, including StreetPass. Dual exterior cameras for 3D camera functionality. Like previous handhelds released by Nintendo, the Nintendo 3DS console wholesale incorporates both an upper and lower LCD display in a clamshell layout. The lower screen features familiar Nintendo touchscreen technology, is 3.02″ (2.42″ wide x 1.81″ high) with 320 x 240 pixel resolution and is capable of displaying 16.77 million colors, but the groundbreaking upper 3D screen of the Nintendo 3DS system is where Nintendo opens up a whole new world of eye-popping gameplay possibilities. This 3.53″ display (3.02″ wide x 1.81″ high) is capable of displaying approximately the same 16.77 million colors, but with 800 x 240 pixel resolution. 400 pixels are allocated to each eye to enable 3D viewing. This stereoscopic 3D display gives objects within the gameworld a feeling of space and depth that extends far into the back of the screen. This amazing depth of field effect vastly increases the ability to see the position of characters and obstacles in compatible game, making many game experiences even more intuitive for all types of players. 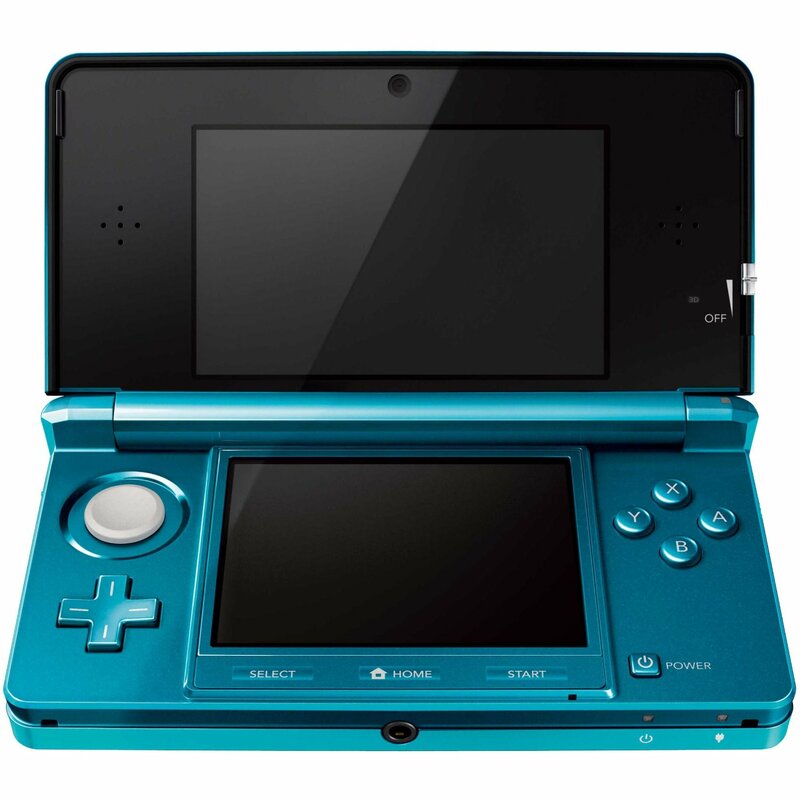 A built-in 3D Depth Slider along the right side of the top display allows you to immediately adjust the intensity of the 3D settings on the Nintendo 3DS system to your liking. The 3D effect can also be turned down completely if the player so chooses. All Nintendo 3DS games and applications can be played in 2D, and look better when played on the Nintendo 3DS than any Nintendo handheld before it. Portable play control reaches a new level with the Nintendo 3DS’ Motion Sensor and Gyro Sensor combination. Together these precision built-in features allow for new and unique gameplay mechanics as the 3DS reacts to real-time motion and tilt. Whether players are twisting their systems side to side, or moving it up and down, their motion-compatible Nintendo 3DS games respond instantly. With the Circle Pad, located above the + Control Pad, Nintendo 3DS offers full analogue control in 3D game worlds. Combined with the touch screen, traditional buttons, camera and microphone input, and advanced motion control of the Motion Sensor and Gyro Sensor, the potential is extraordinary. 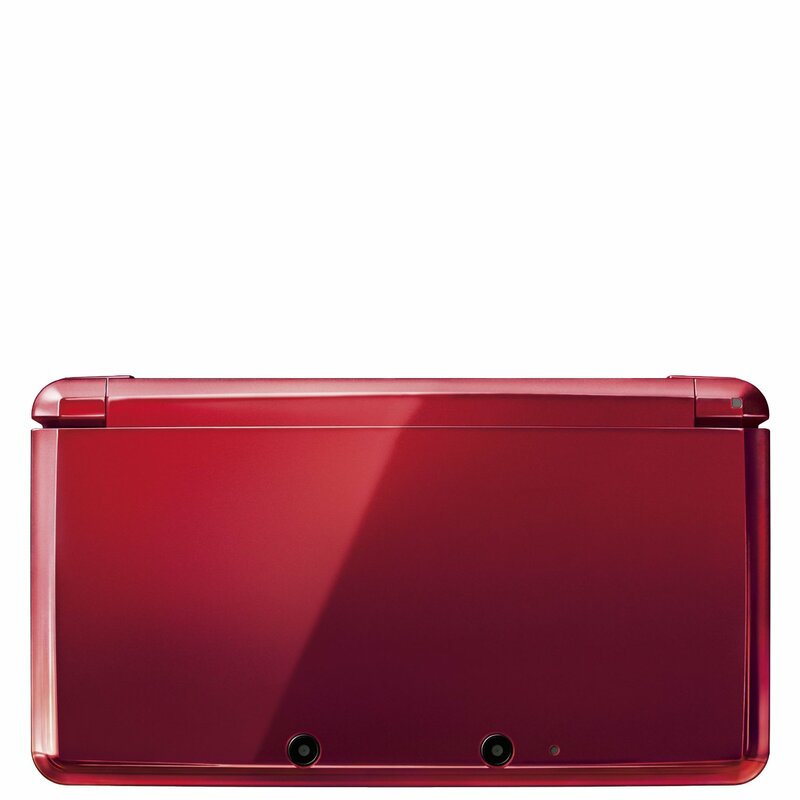 Along with a digital camera facing inwards towards the player, the Nintendo 3DS system features two outer cameras positioned along its upper edge when device is open. These two cameras see the world in 3D, much like the human eye, allowing for the creation of 3D photos – and a similar 3D effect to that seen in Nintendo 3DS games. All cameras feature 640 x 480 resolutions with single focus lenses that use the CMOS capture element and an active pixel count is approximately 300,000 pixels. The adjustable Nintendo 3DS Stylus takes the idea of touch control to a new and even more user-friendly level. Once removed from the holder, the stylus length can be adjusted to your liking with a simple push or pull. Now anyone can achieve the optimum level of comfort while playing games that use the stylus. 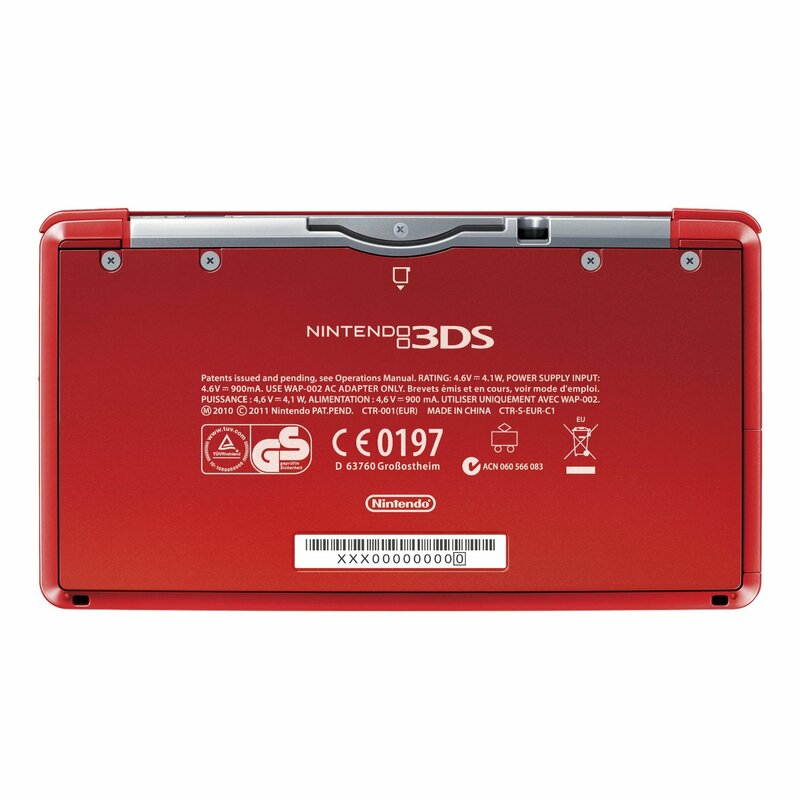 Dock your Nintendo 3DS system whenever you are not using it in the included Charging Cradle to keep it powered. You can then leave the system on in Sleep Mode while charging, so that it can communicate via the SpotPass feature at any time of day or night. Social and wired like no Nintendo system before it, Nintendo 3DS brings fellow players together in exciting new ways with StreetPass communication. 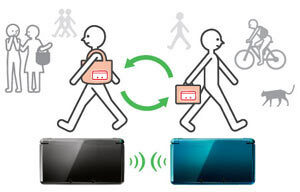 Set your Nintendo 3DS to Sleep Mode and carry it with you wherever you go to exchange game data like Mii characters, high scores, and custom characters with other users you pass on the street. You control what data you exchange and you can exchange data for multiple games at once, making virtual connections with real world people you encounter in your daily life. Every Nintendo 3DS system comes packed with a 2 GB SD memory card. You can use this SD memory card to store your 3D photos, and sound recordings created on the Nintendo 3DS system, and music** from your PC. You can also use it to store games downloaded from the Nintendo eShop. The Nintendo 3DS system has SDHC card compatibility to increase your storage space even further. Nintendo 3DS utilises a frequency of 2.4 GHz, enabling local wireless communication among multiple Nintendo 3DS systems for game play and StreetPass, as well as access to the Internet through wireless LAN access points (supports IEEE802.11 b/g with the WPA/WPA2 security feature). Recommended distance of wireless communication is within 98.4 feet. This can be shorter depending on the environmental situation. Nintendo 3DS system, Nintendo 3DS charging cradle, Nintendo 3DS AC adapter, Nintendo 3DS stylus, SD Memory Card (2 GB), six AR card(s) (view the cards using the outer cameras to play supported AR games), Quick-Start Guide, Operations Manual (including warranty). Size (when closed) – 2.9″ high, 5.3″ long, 0.8″ deep. Upper 3D Display – 3.53″ (3.02″ wide x 1.81″ high) with 800 x 240 pixel resolution, range of 16.77 million colors and 400 pixels are allocated to each eye to enable 3D viewing. Lower Screen – 3.02″ (2.42″ wide, 1.81″ high) with 320 x 240 pixel resolution and range of 16.77 million colors. Cameras – 3 (2 facing out, 1 facing in), each with 640 x 480 resolution capability; single focus lenses using the CMOS capture element; active pixel count is approximately 300,000 pixels. Wireless Functionality – 2.4 GHz, supporting IEEE802.11 b/g with the WPA/WPA2 security features. Input Controls – A/B/X/Y Button, + control pad, L/R button, START/SELECT, Circle Pad (enabling 360-degree analogue input), Touchscreen, embedded microphone, Camera, Motion sensor, Gyro sensor. Other Input Controls – 3D Depth Slider (enabling smooth adjustment of the 3D level effect), HOME (HOME button brings up the HOME menu), Wireless switch (can disable wireless functionality even during game play), POWER button. Parental Controls – Enable parents to restrict game content by ratings as well as use of specific wireless connectivity, 3D functionality, etc. 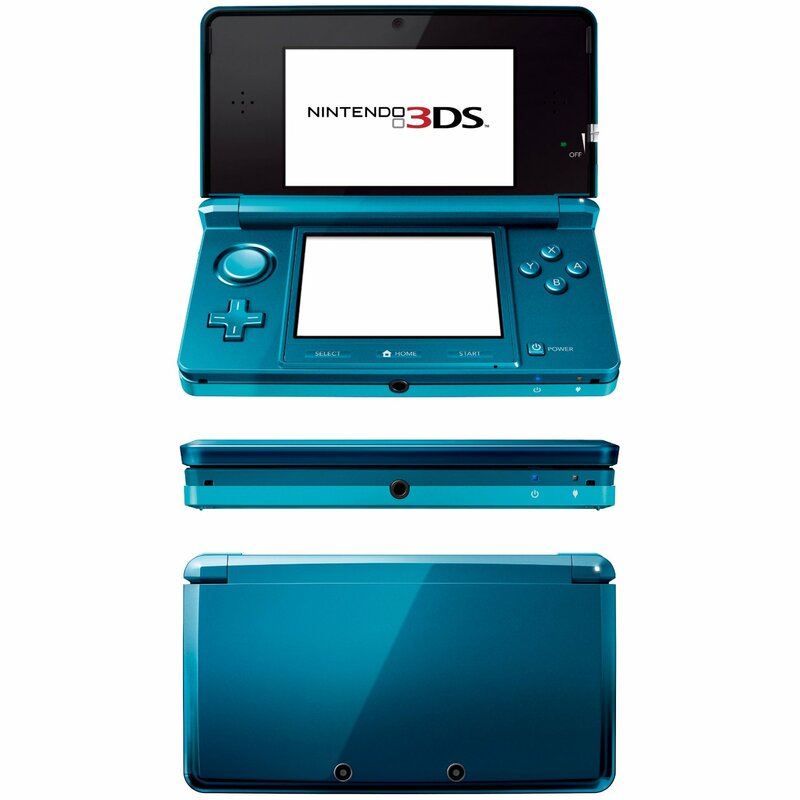 System Transfer – Enable users to transfer already purchased software from one Nintendo 3DS system to another. 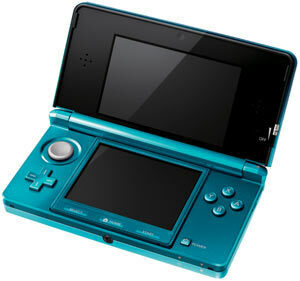 DSiWare purchased for the Nintendo DSi or the Nintendo DSi XL can also be transferred into a Nintendo 3DS system. Built-in Software – Includes: the Nintendo 3DS Camera, Nintendo 3DS Sound, Mii Maker, StreetPass, Mii Plaza, AR Games, Activity Log, Face Raiders, etc. Connector – Game Card slot, SD Card slot, Cradle connector, AC adapter connector, Audio jack (stereo output). Sound – Stereo speakers positioned to the left and right of the top screen (supports virtual surround sound). 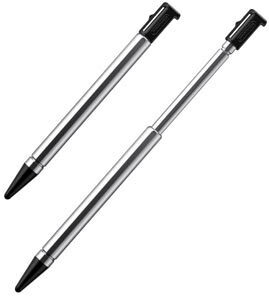 Stylus – Telescoping stylus (approximately 3.94″ when fully extended). Electric Power – AC adapter. Nintendo 3DS Battery Pack (lithium ion battery) [CTR-003]. Approximate Charge Time – 3.5 hours. 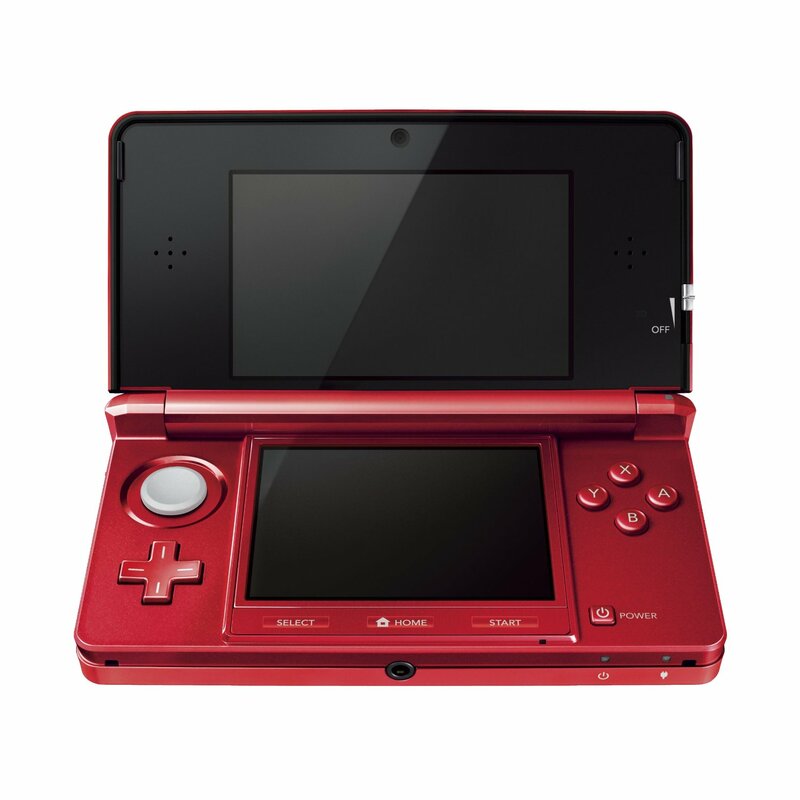 Approximate Battery Duration – 3-5 hours (3DS software), 5-8 hour (DS software and/or with lowered brightness settings). Game Card – Nintendo 3DS Game Card. The size is approximately the same as Nintendo DS Game Card. * Some of these features may not be available at launch. ** Nintendo 3DS is compatible with MP3 and AAC file formats. 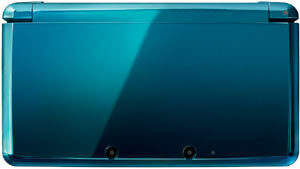 *** Nintendo DS and Nintendo DSi games will be displayed in 2D graphics. Select Nintendo DS games that use accessories in the Game Boy Advance slot of the Nintendo DS system are not compatible with the Nintendo 3DS system. 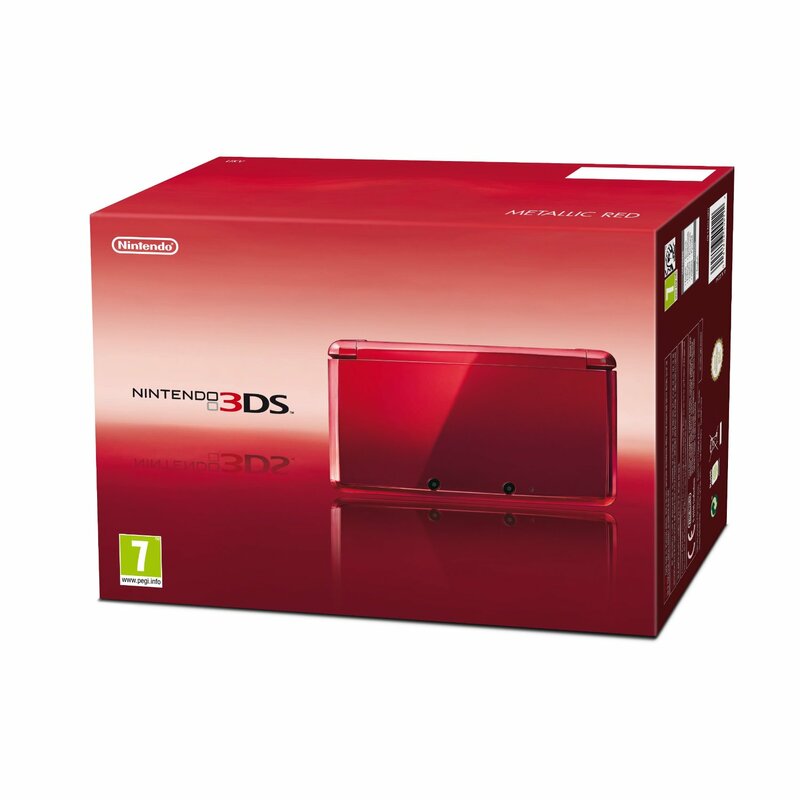 Nintendo jump into the world of 3D with the announcement of this upcoming 3D version of the DS console. Not requiring the user to wear glasses this handheld 3D experience will take games to the next dimension.